I simply cannot help it. 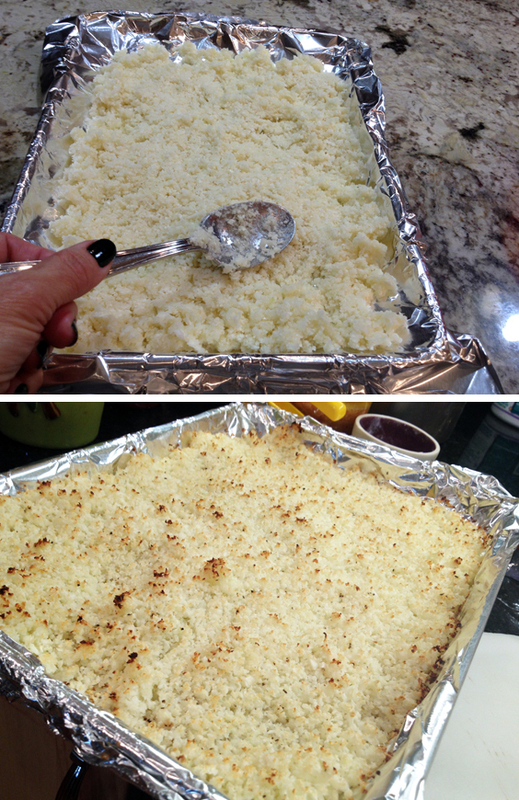 I’m about to share yet another recipe for cauliflower-in-disguise. But, believe me, this one will change your life. Have I ever promised to change your life with a recipe? No. So trust me, because I never lie. Cross my heart, etc etc. The whole thing starts as 99% of the cauli-rice recipes do: process the florets into bits. 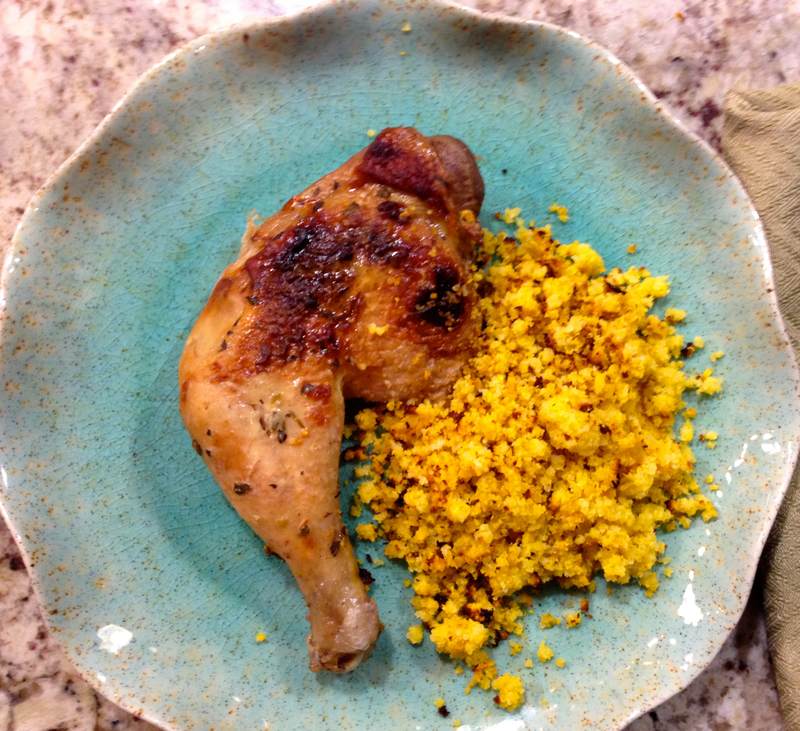 But then, the twist: instead of boiling or simmering it, you will roast the riced cauliflower. Yes, straight into the oven with a delicate coating of coconut oil. And here I am, salivating just by the thought of how great this recipe turns out. Every. Single. Time Perfection, my friends. Perfection. I am so in love with cauliflower that Phil could be a bit jealous of it. You will basically process the cauliflower into bits, then roast it with the coconut oil in a 425 F oven. 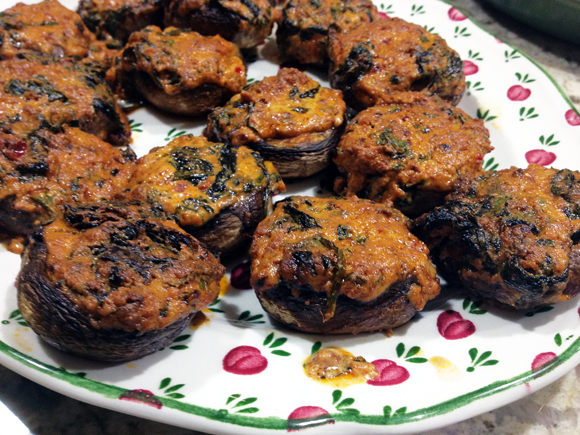 For all the details of the recipe, click here. Meanwhile, prepare your asparagus using any favorite recipe and mixture of spices. Toast some almonds lightly seasoned with salt. 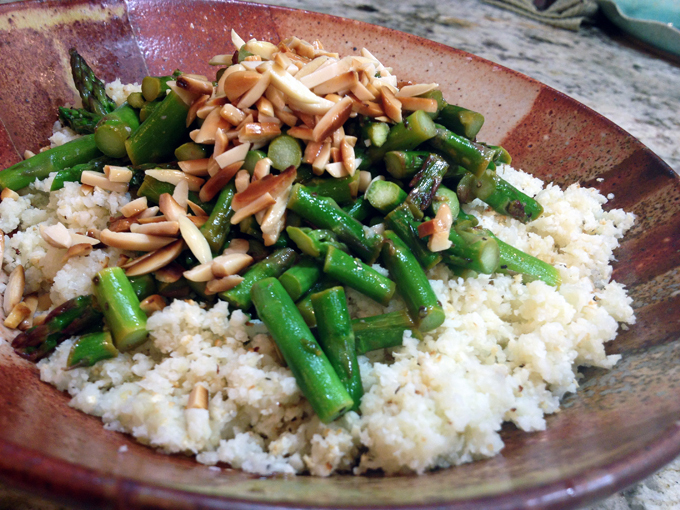 When the cauli-rice is baked, transfer it to a serving bowl, top with the asparagus and almonds, and serve right away. Comments: The difference this method makes in the final product is hard to imagine. The cauli-rice gets all loose and with the exact amount of moisture, not soupy and lifeless. The coconut oil will be barely noticeable. I suspect that even if you don’t care for its taste in this preparation you won’t object. Perfect marriage. You can take this dish into so many different directions: make it Mexican with the right mixture of spices, add a nice home-made salsa on top. Make it Indian with a curry blend, make it Italian, Brazilian, Korean, it is truly a superb blank canvas to work on. I’ve made it several times so far, and also used a yellow-orange cauliflower for a show-stopper of a side-dish. I love it. Love it. Period. Here it is, next to a roasted chicken leg made with a marinade that included a certain ginger syrup of my past. 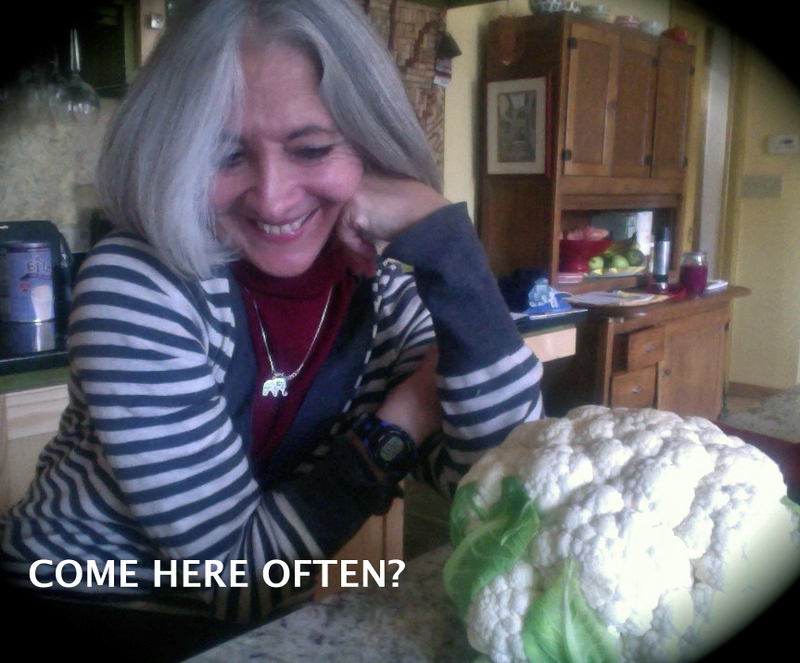 I say goodbye with the firm intention of not blogging on cauliflower for at least a week!. I’ve got will power, I’ll nail this. 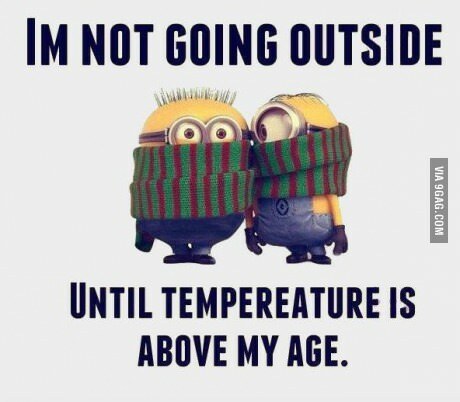 Although…. It seems like FOREVER since we’ve had a Reveal Day of The Secret Recipe Club, but finally here we are, having the greatest time together… My assigned blog for the first month of 2015 has such a cute name, makes me smile: A Calculated Whisk… Becky, the cook behind the blog is a teacher of English to young Spanish-speaking kids, and next year will be starting to work on her master’s degree in Speech and Language Pathology. Impressive! Her site focuses on Paleo-friendly recipes, but is not restricted to them. For those interested in the Paleo life-style, I recommend reading her series of posts starting in January 1st, 2014, in which she shares her experience doing the Whole30 thing and blogging daily about it. That is endurance on several levels! 😉 Becky has two incredibly cute cats, Cupcake (a butter-addict) and Furpaws (prefers to hang inside the kitchen sink hoping for a sip of water straight from the faucet). I say we pet lovers have our share of idiosyncratic creatures to deal with… I am quite fond of Paleo recipes because they are usually moderate in carbs and high in protein, which is my preferred way to eat, so I had no problem finding stuff in her blog that pleased me. In fact, I intend to enjoy in the near future her Chicken Meatballs with Garlic Kale Marinara, her Chickpea Mushroom Spread (this one not Paleo), her Pumpkin and Pecorino Souffle (pretty intriguing gluten-free version), and her Spicy Cocoa Chili. 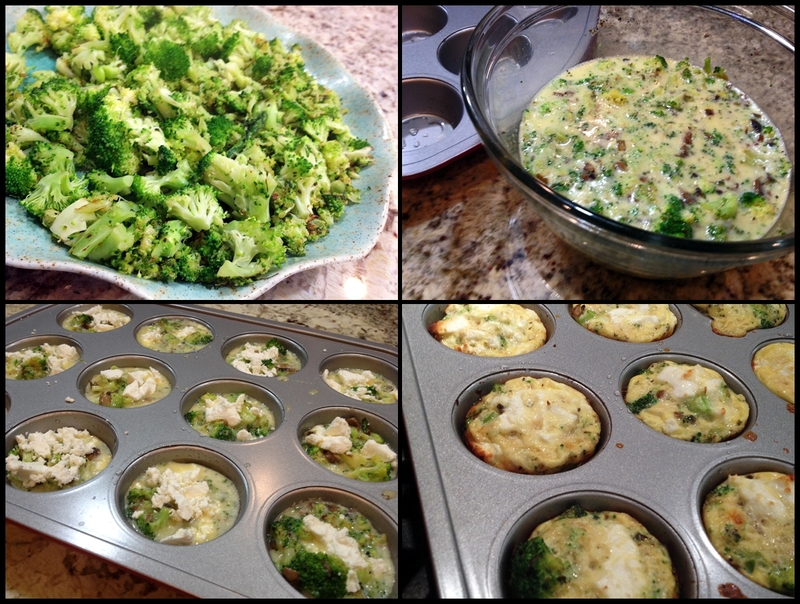 But this recipe won my heart to share with you today: Mini-Quiches with Duxelles and Broccoli. As I expected, they were cute and absolutely delicious! Heat the oven to 350 degrees F, and grease a 12-cup muffin pan with olive oil. To make the duxelles, melt the ghee in a medium skillet over low heat. Add the shallots and garlic and saute, stirring frequently, until softened but not browned, 3-4 minutes. Add the mushrooms and raise the heat to medium. Cook, stirring frequently, until the mushrooms have released their liquid and most of it is gone, about 10 minutes. Season the duxelles liberally with salt and pepper, then set aside on a plate to cool. Return the skillet to medium and add the chopped broccoli. Cook, stirring frequently, until bright green and crisp tender, about five minutes. Set aside to cool. In a large bowl, whisk together the remaining ingredients. Stir in the duxelles and broccoli. Divide the mixture among the 12 greased muffin cups, filling each one about 3/4 full. Bake for 15-20 minutes, or until just set in the middle. 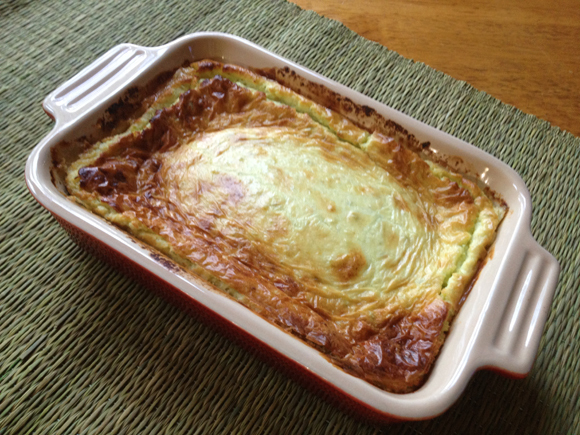 Gently run a knife around the edge of each quiche, and carefully scoop them out with a spoon. Enjoy hot or warm. 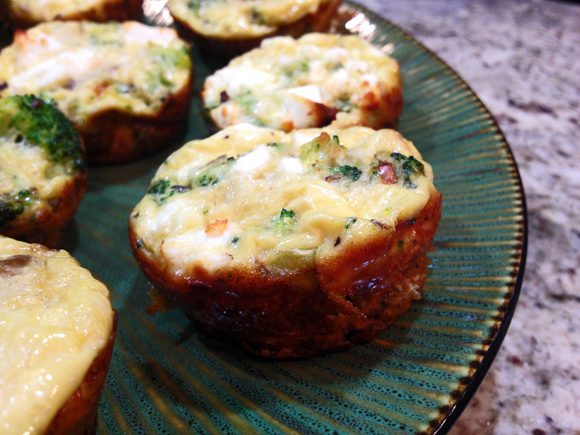 Leftover quiches can be stored in the fridge for 3-4 days and reheated. Comments: I turned this recipe into a Neolithic version by adding feta cheese, my apologies to all modern cave men out there. But some pieces of leftover feta were staring at me from the fridge JUST as I was grabbing the eggs, and they actually screamed when left behind: “Please, take us, take us!”. I could not ignore them, I’m sure Becky will forgive me for the tweak. Those of you on a strict Paleo kick, simply omit the feta, but adjust the salt accordingly. 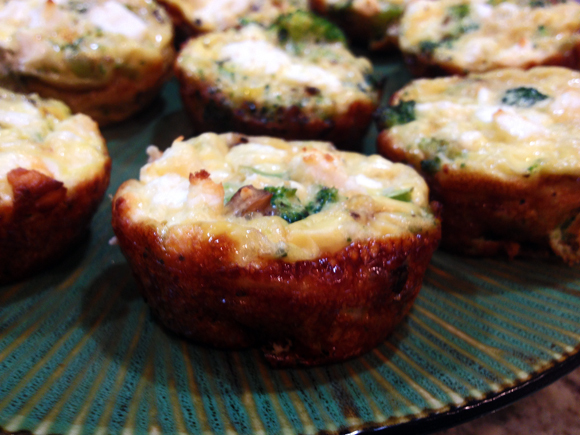 These were so tasty and convenient both as a side-dish at dinner or as a snack. Of course, you can think of all types of goodies to add to the mixture, keeping it Paleo with diced roasted butternut squash, shredded zucchini, or stretching a bit its limits with a little Roquefort or other yummy cheese. However, this version joining broccoli with mushrooms is going to be hard to beat. As usual, my readers are all invited to go poke a blue frog. There is one waiting for you at the end of the post, and once poked, you will be able to see what all my fellow Secreters have been up to in the first month of 2015! And if you are curious about who had my blog, take a look at this beautiful post by Tara. She made brigadeiros! Clever girl! 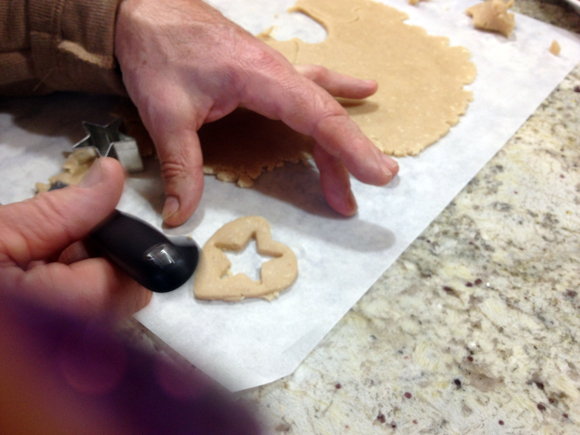 Anyway, I am honored to be part of the list of lucky bloggers invited to compose a post for her site, and it’s my turn to invite you to read about our adventure making Linzer Cookies! Our adventure, you might ask? Yes, this was a project Phil and I tackled together on a chilly Sunday morning. Fun, fun, fun… and mighty tasty! Now, without further ado, click here for the full post. Special thanks to Gary for sending this my way…. Talk about being slow to blog about stuff. This recipe was made last August, so it will appeal a lot more now to the lucky folks who live in places such as Australia, New Zealand, Brazil, Argentina, are enjoying the best time of their lives, aka SUMMER! I was slow to blog, but even slower to give it a try, as the recipe is from Fine Cooking, year 2006. Eight years and a few months ago. You will need to prepare in advance a delicious rosemary-infused olive oil, and there will be leftovers. I confess that this was probably the reason why I dragged my foot for so long before making this recipe. I am not big on preparing infused oils and sauces and dressings that can be used later. They sit in the fridge making me feel guilty as the days go by and their expiration date approaches. Still this rosemary concoction would be great in a simple spaghetti aglio & olio or drizzled over your favorite pizza topping. Very flavorful stuff, the smell as it simmers will make you wanna dance. Not a dancer? It will make you wanna sing. Not a singer either? I will settle for a smile. Make it a big one, though. Up to a day ahead and at least a couple of hours before serving, toss the chicken in a medium bowl with 2 Tbs. 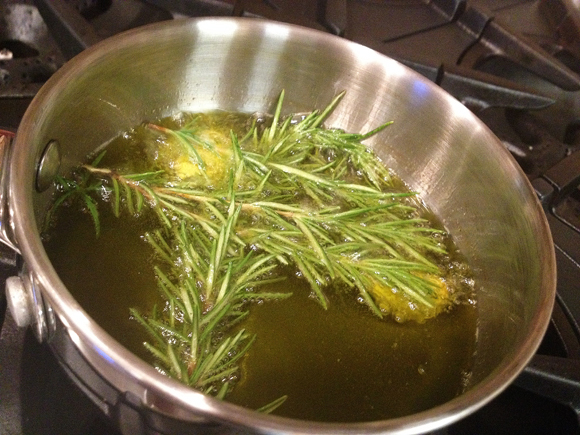 of the infused oil, the fresh rosemary, 1 tsp. kosher salt, and 1/2 tsp. pepper. Heat a grill to medium heat. Divide the remaining 1/2 cup oil into two small bowls (one for grilling and one for serving, if desired). 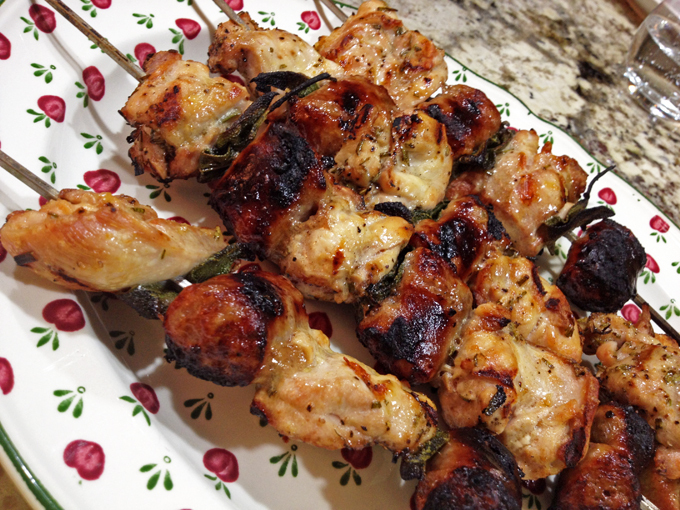 Alternately thread three pieces of sausage, three pieces of chicken, and four sage leaves onto each of six 12-inch metal skewers. 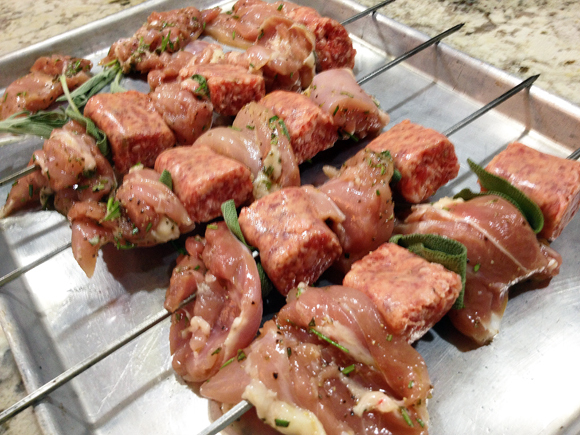 Grill the skewers, covered, until one side is browned and has good grill marks, about 4 min. Brush with some of the rosemary-garlic oil, flip, and cook the other side until it, too, has good grill marks, about 4 min. Brush with more oil and flip again. Continue cooking, flipping, and brushing with oil until the sausage and chicken are both cooked through, about 10 min. more. Let cool for a couple of minutes and then arrange on a platter, and serve with additional oil, if so desired. Heat the olive oil and garlic in a small saucepan over medium heat, stirring occasionally, until the garlic starts to bubble steadily, 3 to 4 min. Add the rosemary, remove from the heat, and let cool to room temperature. Transfer to a clean glass jar or other storage container, cover, and refrigerate. Use within five days. Note added after publication: I was kindly reminded by my readers in Florida that they are currently all happy under a 70 F sunny weather. It is a bit like sticking the knife and twisting, so yes, go ahead Floridians, and make this recipe. Think about me as you do it, and send me some of your warm weather ASAP. 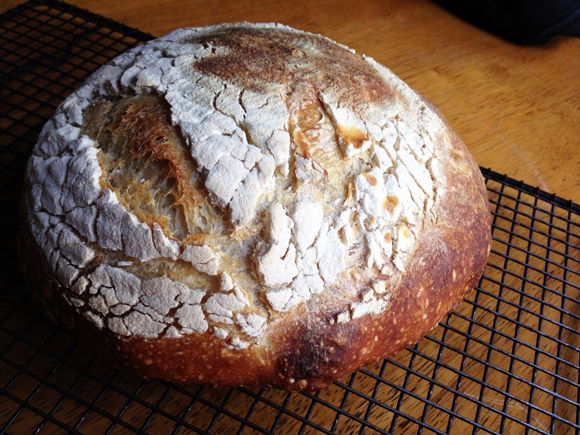 First bread post of 2015! Not the first bake of the year, because this was made for Phil’s birthday on the last week of December. He chose the whole menu, which consisted of oysters on the half-shell as a first course, and clam chowder as the main dish. Also according to his request, no dessert to keep things moderate. Perfect for me. The bread was all that bowl of chowdah needed to shine in its creamy glory! 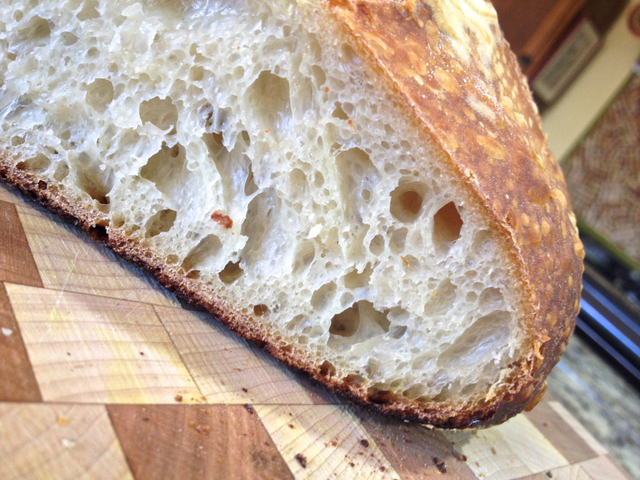 A little walk through the method… The bread takes three days to prepare, but don’t let that intimidate you. It is worth your time. The interesting twist in the recipe is keeping your sourdough starter at a higher temperature of fermentation, around 85 F. During the winter that can be a challenge, but I am the lucky owner of a bread proofing box. Problem solved. Because the starter ferments at a higher temperature you will need to refresh it more often than usual, but as I mentioned in my previous sourdough post, Ken is particularly helpful in laying out a nice schedule for each of his recipes. After the bulk fermentation, in which I gave four folding cycles to the dough, the bread is shaped, and retarded in the fridge overnight. From the fridge it goes straight into the hot oven, no need to bring it to room temperature. 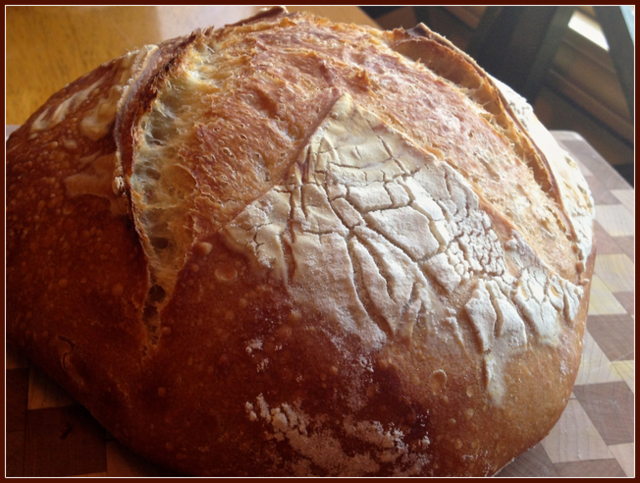 The bread had good oven spring, the crust was just the way we love it! ONE YEAR AGO: Bran Muffins, Rainbows, and a wonderful surprise!